This increase caused earth's average atmospheric temperature to go up about 1. degree F in the 20th century. Now, according to NOAA, the global warming rate in the last 25 years has risen to 3.6 degrees F per century. This tends to confirm the predictions of temperature increases made by international panels of climate scientists (IPCC). The ocean has actually absorbed most of the added CO2 and heat -- becoming warmer and very slightly more acidic. These increases, seemingly small, have a giant effect on weather, climate zones, plants and animals, sea life, glaciers and river flow -- and thus human life. My project and this Web site seek to document these changes. For more on past climate and today's weather, see especially the Paleoclimate and Weather sections. In general global temperatures have risen since the 19th century industrial revolution. There is little scientific question the reason is a steep increase in atmospheric carbon dioxide -- CO2 -- from human use of fossil fuels. Methane, ozone, other gases and dusts have also increased greatly. The mechanism of our atmosphere is that gases like CO2 and methane trap some of the sun's radiation and hold it in the lower atmosphere, heating it. The natural greenhouse effect made the earth warm enough for life, but the effect is much higher now. 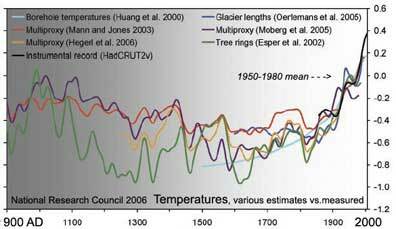 Ice core records show that whenever CO2 has increased in the earth's past, so has temperature. 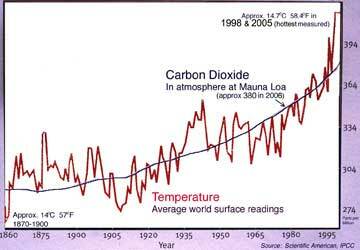 The recent increase in atmospheric CO2 is 200 times as great as any previous change seen in the ice cores. The current level is 380 parts per million, the highest in more than 650,000 years. It shows no signs of decreasing. April 24 (Bloomberg) -- Global warming is hitting the Arctic harder and faster than scientists expected, causing unforeseen changes to the frigid region's ice, wildlife, atmosphere and oceans, the conservation group WWF said. The most prominent differences observed over the last three years include a ``massively accelerated'' decline in summer sea ice and ``much greater'' shrinking of the Greenland Ice Sheet, the environmental campaign group, known in the U.S. as the World Wildlife Fund, said in a 123-page report today. 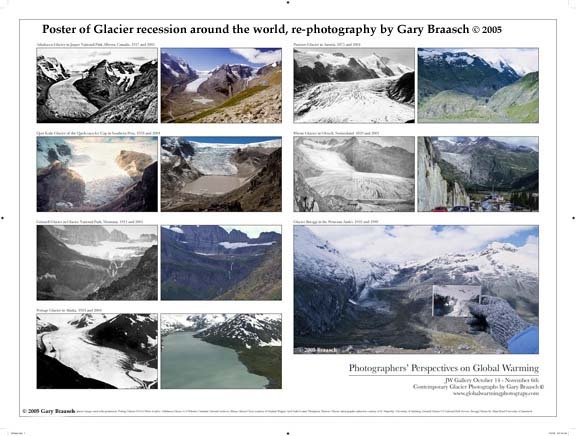 The World View of Global Warming project is documenting this change through science photography from the Arctic to Antarctica, from glaciers to the oceans, across all climate zones. Rapid climate change and its effects is fast becoming one of the prime events of the 21st century. It is real and it is accelerating across the globe. As the effects of this change combine with overpopulation and weather crises, climate disruptions will affect more people than does war. The 2005 average global temperature equaled (within several hundredths of a degree) the record warm year of 1998, according to meteorologists. 2002-4 were nearly as warm, and the 11 warmest years on record have all occurred since 1990. In response, our planet has been changing with warming winds and rising seas. At the poles and in mountains, ice is under fire and glaciers are receding. Down into the temperate zone, change is rearranging the boundaries of life. The plants and animals with whom we share the planet are adapting and moving -- some even going extinct -- because they have no choice. ``We're seeing more rapid temperature-warming,'' Ted Scambos, lead scientist at the National Snow and Ice Data Center in Boulder, Colorado, said by phone. The best explanation is ``a trigger from greenhouse gases,'' he said. Scambos wasn't involved in the WWF report. Conserving Arctic ecosystems requires slashing emissions blamed for climate change and reducing human activities that threaten the region that stretches between the North Pole and the northern timberlines of Eurasia and North America, the WWF said.